We’d love your help. Let us know what’s wrong with this preview of Your Medical Mind by Jerome Groopman. An entirely new way to make the best medical decisions. Making the right medical decisions is harder than ever. We are overwhelmed by information from all sides—whether our doctors’ recommendations, dissenting experts, confusing statistics, or testimonials on the Internet. Now Doctors Groopman and Hartzband reveal that each of us has a “medical mind,” a highly individual An entirely new way to make the best medical decisions. To ask other readers questions about Your Medical Mind, please sign up. I found this book on the "Financial Planner's 20 must read books" list. Does anyone know if this publication has any information on how to approach the financial part of your medical needs? As in planning, insurance, expenses that are expected to be paid, etc? Thanks. I found Jerome Groopman’s book How Doctors Think helpful and enlightening. 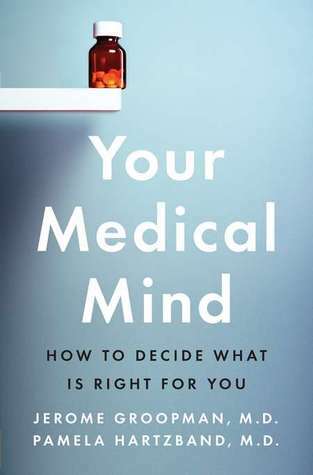 So when I happened across Your Medical Mind: How to Decide What is Right for You, written by Groopman and his wife Pamela Hartzband (both are MDs) I grabbed it right up. In truth, I also chose it because I have an important medical decision to make regarding surgery. I was hoping Groopman and Hartzband would again enlighten me. The structure of the book follows from the least of the difficult medical decisions we may need I found Jerome Groopman’s book How Doctors Think helpful and enlightening. 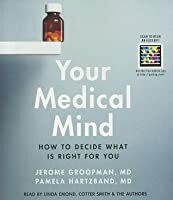 So when I happened across Your Medical Mind: How to Decide What is Right for You, written by Groopman and his wife Pamela Hartzband (both are MDs) I grabbed it right up. In truth, I also chose it because I have an important medical decision to make regarding surgery. I was hoping Groopman and Hartzband would again enlighten me. The structure of the book follows from the least of the difficult medical decisions we may need to make to the most difficult. It acknowledges that choosing whether or not to take a medicine is considerably different than discussing what “no heroic efforts” means to a dying patient. This structure helps give context to the complex ideas Groopman and Hartzband put forth. Detailed patient stories are used throughout to illustrate the concepts as well, and this makes the book more readable and heartfelt. I really liked this book because it explained to me, in a way I didn't know, but thought I did, exactly how a person's living will works out in the end. It also explained a ton of things to me about how my personal opinions about my own medical treatment have been formed all through my life, and, unbeknownst to me, through the way my own Mother, Grandparents, and even Great-Grandparents felt, and/or thought about doctors, medicines, well, everything to do with how I would end up choosing how to decide what to do in my very own medical emergencies. I have had six near death situations with my own life already, yet I really had absolutely no idea how or why I choose the physicians I chose, nor why I did or did not accept certain medical treatments. This book goes into many patient's (no names of course) histories and why they chose what, when, and how to take care of their own personal medical problems. To me it is a fascinating book because I do have very many various medical problems. I had always thought I knew exactly why I opted for this treatment, or that treatment; that is of course, the few times I had a choice at all. I'm not positive, but I do believe that this book will really resonate with people who are living with serious diseases, as I am, and/or have taken care of loved ones who have had serious diseases, which I have done also. But, that is of course simply my own opinion, I could be totally incorrect about my belief! Great reading to all, and to all a Ta Ta!! Do you have family member in the hospital? Perhaps you have a loved one with a “Do Not Resuscitate” order? Are you afraid to pull the plug on Mom or Dad? If yes, then you need to buy this book! Divine read! Dr. Jerome Groopman's and Pamela Hartzband's "Your Medical Mind: How to Decide What is Right for You" takes you on a dangerous tour with life experiences and stories of difficult medical decisions. Groopman and Hartzband took me down a treacherous flowing river armed with a boatload of knowled Do you have family member in the hospital? Perhaps you have a loved one with a “Do Not Resuscitate” order? Are you afraid to pull the plug on Mom or Dad? If yes, then you need to buy this book! Divine read! Dr. Jerome Groopman's and Pamela Hartzband's "Your Medical Mind: How to Decide What is Right for You" takes you on a dangerous tour with life experiences and stories of difficult medical decisions. Groopman and Hartzband took me down a treacherous flowing river armed with a boatload of knowledge to the patients’ hospital deathbed. Your Medical Mind illuminates in simple terms past bias of Patients and their Families and how it can adversely engender an anxiety pregnant or even terminal medical decision on the part of the family. This book offers a surreptitious view into some of the most arduous decisions facing the medical community, patient and family. Essential book for Physicians as well and offers lifesaving advise to the commonly forgotten Physician with “When taking care of me, take care of you to make sure you don’t burn out by the only time your optimism is needed most” (116, Groopman & Hartzband). Crucial must-read for Medical Students, Physicians and Families, this one is being added to my Queen Bee list for the golden poetic wisdom found within. Jerome Groopman, medical writer par excellence, has written another fascinating book, this time with his wife, also a doctor. This book is a must-read, since it's about something we all face: how do we think about medical decisions? Do we favor aggressive treatment or do we prefer to do as little as possible? Do we put our faith in what our doctors say, or are we skeptics? Do we love medicine and technology, or do we prefer natural remedies and letting the body heal itself? Even more importantly Jerome Groopman, medical writer par excellence, has written another fascinating book, this time with his wife, also a doctor. This book is a must-read, since it's about something we all face: how do we think about medical decisions? Do we favor aggressive treatment or do we prefer to do as little as possible? Do we put our faith in what our doctors say, or are we skeptics? Do we love medicine and technology, or do we prefer natural remedies and letting the body heal itself? Even more importantly, it's about how understanding how we view these issues can help us make medical decisions that are better informed and that will make us happier, even if the outcome is not great. As with Groopman's other books, the stories of many patients are woven throughout, including those of the authors. These stories illustrate the various lessons of the book and, as the authors intend, lead the reader to consider how our own backgrounds, family and medical histories, upbringings, and temperaments incline us to be more or less comfortable with different approaches to medical treatment. In addition, they add almost a voyeuristic thrill as we see intimate details of strangers' lives and are asked to contemplate how we may be similar to or different from the people whose worlds we are peeking into. This book is important. Not especially exciting, but definitely important. At some point in our lives we will all get sick or hurt and eventually we will all die. It is very likely that when those things occur, we will receive treatment from the medical community. And we or our loved ones will have to make difficult yet crucial decisions about that treatment. Through a series of case studies, Your Medical Mind examines how real patients receiving medical care made decisions about whether to get t This book is important. Not especially exciting, but definitely important. At some point in our lives we will all get sick or hurt and eventually we will all die. It is very likely that when those things occur, we will receive treatment from the medical community. And we or our loved ones will have to make difficult yet crucial decisions about that treatment. Through a series of case studies, Your Medical Mind examines how real patients receiving medical care made decisions about whether to get treatment, what kind of treatment to get, which doctors to trust, and how far they wanted those treatments to go in life-threatening situations. It starts with the relatively straightforward question of whether or not to take medication for high blood pressure and proceeds to more life-threatening scenarios. Most people don't plan for the complicated decisions they may be called on to make while sick or dying because they can't imagine being in those scenarios until they get there. So reading about people who have been in such situations is illuminating. Perhaps the biggest message that the authors of the book have is that decisions about treatment are ultimately always in the patient's hands, no matter how authoritative the doctor may sound. So for the patient, knowing what they want is important. Patients tend to fall in a spectrum in terms of how they make medical decisions. The authors identify an axis of natural healing vs technology, another one of minimal treatment versus aggressive prevention, and still another of skeptic versus believer. So for example, a patient who is very skeptical and a minimalist will want to weigh all treatment options for themselves, regardless of what medical experts tell them, and will probably take the least treatment possible. A patient who is a believer and a 'maximalist' will do everything the doctor recommends and then some, in hopes of preventing future problems. Critically, neither approach is right or wrong; the patient needs to decide what is right for them. Medicine is not an exact science. Specialists often disagree about the best course of treatment. Even when medical opinion is fairly united, not everything is right for everybody. The authors recommend patients ask about 'number needed to treat' and 'number needed to harm' when weighing the potential benefits of a treatment against its costs. One interesting thing the book talks about is the idea of 'living wills'. Studies have found that living wills are often not that effective, because healthy people can often not predict their own wishes when they are very ill and in need of dramatic medical intervention. Simply put, people change their minds. People are also surprisingly capable of adapting to limitations, often much more so than they predict they will be. So a healthy person may think, for instance, "I wouldn't want to live if I had to be hooked up to a machine," and then find that when that time comes they feel quite differently. I feel like I'm asking this question a lot lately, but who comes up with book titles these days, and is it a requirement that said person read the book first? Based on the disconnect between titles and materials, I'm inclined to think the answer to the second part is a firm "no." There is some good information in this book, but the title implies it might offer some specific suggestions for things to think about when deciding on medical treatment. It really doesn't What it offer are a lot of case I feel like I'm asking this question a lot lately, but who comes up with book titles these days, and is it a requirement that said person read the book first? Based on the disconnect between titles and materials, I'm inclined to think the answer to the second part is a firm "no." There is some good information in this book, but the title implies it might offer some specific suggestions for things to think about when deciding on medical treatment. It really doesn't What it offer are a lot of case studies, some theories on how patients approach information or treatment options, and some vague back and forth about quality of life versus longevity and how patients find it hard imagine themselves in a dire health crisis beforehand. Not useless, but really that helpful. It seems to be more a book aimed at explaining patient decision-making strategies to doctors than one on explaining to the patient and proxy how to navigate or negotiate with the medical industry. While the concept of patient "types (that patients are either minimalists or maxilmalists, doubters or believers, and naturalists or technophiles) is interesting, it seems like something most people already know about themselves and fairly common sense. That people will often change their minds when presented with new information or when neck-deep in a new-to-them situation also seems pretty common sense. Fascinating and very thought provoking. As a retired physician (oncologist) , who is now on the receiving end of medical care, I found this book to be very thought provoking and valuable. Being on the physician side of making decisions is very different from now being on the patient's side of the struggle. There really are many times no easy or certain answers. Drs and patients must recognize and understand the "uncertainties" that are ever present in modern medicine. A riveting read of case studies on how different people choose treatments. Especially relevant when you have a health condition (or conditions) and feel unsure as to the right way to go. Your Medical Mind isn't the kind of book I would have picked up 4 to 5 years ago, and most definitely not when it was first published 8 years ago in 2011. But having entered that season of life when one becomes acutely aware of one's mortality and that the days of one's peak physical condition are long past, this is an important read. If you're not medically trained and should you fall sick, how might you decide what treatment option is the best for you? How to navigate the masses of (often conf Your Medical Mind isn't the kind of book I would have picked up 4 to 5 years ago, and most definitely not when it was first published 8 years ago in 2011. But having entered that season of life when one becomes acutely aware of one's mortality and that the days of one's peak physical condition are long past, this is an important read. If you're not medically trained and should you fall sick, how might you decide what treatment option is the best for you? How to navigate the masses of (often conflicting) information from various sources - from doctors (first, second, third opinions), friends and family and, of course, the Internet? How to make important decisions that could literally mean life or death when your physical and mental state is hardly conducive to considered thought? In most cases, there is no definitive answer on when to treat or how to treat. It is not evident what the best option for an individual might be. In their book, Jerome Groopman and his wife, Pamela Hartzband, argue that the best decision for an individual is one that they must feel at peace with, that it is one that is consistent with their values and priorities. Values and priorities are highly subjective. Yet, in medical decision-making, the focus is often on quantitative data - probabilities and estimates, frequencies and proportions. Groopman and Hartzband argue that we must first understand what our decision-making preferences and orientation is - are we maximalists (desiring everything possible to be done) or minimalists (wary of over treatment and will refuse intervention unless absolutely necessary); believers (who operate on the premise that there is a successful solution for their problem somewhere and they just have to look hard to find it) or doubters (who are deeply risk averse and are wary of the potential side effects of any treatment option); having a naturalism orientation or a technology orientation? These preferences are the product of our upbringing (what did our parents bring us up to believe? that we should do exactly as what the latest research advises? or that "doctors don't know everything?) and of our personal experiences. And it is only when we are aware of our preferences and orientation that we can unpack the hidden influences that can sway our thinking and distort our judgement. This might understanding might lead one to look for a doctor who shares the same orientation - a maximalist doctor for a maximalist patient and a minimalist doctor for a patient who prefers fewer and less aggressive interventions. But perhaps it is more important to look for a doctor who may not share your preferences but understands and respects them, who will facilitate your decision-making process but is prepared to challenge it if necessary. By sharing the medical decision making with a doctor who understands your preferences, you share "the burden of choice, so you lessen your risk for regret". The focus of Your Medical Mind is very much on the individual and how we can help people make medical decisions they can be at peace with. But it sparks reflection on what this might mean for how most healthcare systems are set up today, which aim to "standardise treatments rather than customise them to the individual" and "reduce the experience of illness to numbers". In our quest for resource efficiency, we may try to roll out standard protocols and regimens but is this truly in the patient's best interests? Patients care not only about treatment outcomes and waiting times (although these are up there in terms of priority), but they also want to feel respected, reassured and comforted. The anecdotes in Your Medical Mind remind us that medicine is not only a scientific endeavour, but is ultimately a very human one. Reading this book makes me realized we really need to take care of our health since young. There are a lot of cases about cancer treatment and medicine topics arise on the internet for many years. People and experts have been debating the pro and the cons of health supplement and medicine consumption for people. And there are many controversial topics about the health care industry manufacturer's products whether or not, are they genuinely been contributing for the benefit of the people's health Reading this book makes me realized we really need to take care of our health since young. There are a lot of cases about cancer treatment and medicine topics arise on the internet for many years. People and experts have been debating the pro and the cons of health supplement and medicine consumption for people. And there are many controversial topics about the health care industry manufacturer's products whether or not, are they genuinely been contributing for the benefit of the people's health or making money from the people. Advertisement for drugs may include statistics, but fundamentally these are the ads that designed to tell a compelling tale to the people who consume the media. Very often in medicine, there is more than one way to address a problem. As we all know, much of medicine is still an uncertain science, existing in a gray zone, not clearly black or white. It might confuse people and paralyzed our decision making when coming to the crucial moment in our life. Illness. In this book, the author describes that the overloaded information on the internet and also by the relatives of our family are often paralyzed our decision making. How do we know what is actually right for us? The answer often lies within us, not the experts. Because ultimately, it the patient who benefit from the treatment or suffers the consequences of its side effects, so ultimately it is the patient who should decide. Before we go for a treatment, we should always do the research and ask ourselves, "What do we read about the treatment? What did the doctors tell us the side effects? What are we willing to live with? What does it take to deal with the particular conditions?" The author describes there are few types of people when comes to decision making for the treatment. Believers and doubters; maximalists and minimalists; naturalism orientation or a technology orientation. As we grow up, we broaden our exposure to the experiences of colleagues, friends, and acquaintances. We hear the tales, try to locate ourselves in them. We imagine how we would make the decision when coming to the situation in life. Cognitive psychologists call it "Availability Biases", and it is often that the circumstances of our life that influenced our mindset to decision making. 1. Whether to take a statin, or a blood thinner, with potential benefits and side effects. 2: What treatment to choose for prostate cancer: traditional surgery, robotic surgery, radiotherapy or nothing. Given a BRCA1 mutation, should the patient go and have the operation to remove the breadth and ovaries. 3. End of life problems: how to decide whether ‘heroic measures’ should be undertaken. 4. Medical proxy: the difficulty and stress the surrogate feels trying to beat guess the patient’s wish. From the doctors’ point of view, it is also informative. Paternalistic styles are out. Physicians should lay down the choices clearly, and help the patients understand their own preferences in making a decision. Do not give false reassurances. The ‘best’ doctor may not be the most suitable for everyone. Whether making life-or-death decisions — or simply choosing a drug — we're flooded with information and conflicting advice. Doctors, the media, statistics, guidelines, family members and Internet strangers can all weigh in on the best medications to take or the most effective treatment options. So how do you pick the best one? "There is no one right answer for everyone," says Harvard Medical School oncologist Jerome Groopman. "But it's very important for people to understand how the information applies to them as individuals and then to understand ... their own personal approach to making choices ... so that they're confident that what they chose is right for them." Groopman and Pamela Hartzband, an endocrinologist at Harvard Medical School, have teamed up to write Your Medical Mind, a guidebook for patients trying to sift through medical choices and make the best decisions for themselves and their family members. Groopman and Hartzband say most patients generally fall into two categories: believers and doubters. "The believers are convinced that there's a good solution to their problem and they just want to go for it. Sometimes they are believers in technology, sometimes they are believers in more natural remedies, but they believe," says Hartzband. "And the doubters are people who are always skeptical, worrying about side effects, worried about risks and that maybe the treatment will be worse than the disease." Recognizing where someone lies on that spectrum is helpful for both patients and their physicians, says Hartzband. "Understanding why a patient wants something or doesn't want something really helps you lead them to the best possible choice," she says. "It helps patients understand where you [as the physician] are coming from and vice versa." Patients who fall into the doubter category may worry about whether prescribed medications are necessary, which could lead to noncompliance with a doctor's orders. Hartzband says that more than a third of all people do not currently fill their prescriptions or take their newly prescribed medications. Other patients fill the prescription and take the medication — but ask not to know about potential side effects. This can also be dangerous, says Groopman. "I want to make sure if the patient's feeling something, he or she is alert to it so that I can intervene as early as possible to prevent it from spiraling out of control," he says. "If a patient says, 'I want to take the drugs but I don't want to know about any side effects,' I say, 'Let's backtrack a little and see what's important for you to know, because I want to make sure you're getting the best and safest care.' "
Sometimes getting the best and safest care also means realizing that guidelines or "best practices" aren't engraved in stone, says Groopman. He explains that best practices, which have become more common in recent years, come from experts who designate a course of treatment for patients with certain conditions, based on evidence and scientific studies. For instance, many hospitals now instruct residents and attending physicians to give aspirin to people with chest pain and symptoms of a heart attack. "That kind of [emergency] medicine is amenable to standardization and best practices because it really doesn't involve patient choice," says Groopman. " ... But what's happened, we believe, is that many of these expert committees have overreached. And they're trying to make [medicine] one size fits all and dictate that every diabetic is treated [the same] way or every woman with breast cancer should be treated [the same way]." Treating the patient as an individual — and not as a statistic or algorithm to be solved — is vitally important, says Groopman, because the best and safest care might not always be standardized. "If you step back, you can have different groups of experts coming out with different best practices," he says. "And what that tells you is that there is no right answer when you move into this gray zone of medicine." From an analysis of 100 best practices put together by committees in internal medicine, Groopman and Hartzband discovered that 14 percent were contradicted within a year. Within two years, a quarter of the best practices were contradicted, and by five years, almost half of the rules were overturned. This is not to say that guidelines aren't useful, says Hartzband. She emphasizes that she and Groopman are not "anti-guidelines." "Guidelines have an enormous amount of very useful information, and I think they can be extremely helpful," she says. "But they shouldn't be applied in a blanket way without thinking about the individual patient." Quick read with some worthwhile points. One thing I want to remember from this book is the authors' discussion about the different mindsets of patients with regards to their medical decision-making. Minimalist vs maximalist, believer vs doubter, and naturalist vs technologist. Helping patients assign these labels to themselves might be useful in helping them decide what treatments are right for them. As for me, I am a minimalist, doubter, naturalist. We'll see if that changes at all over the cou Quick read with some worthwhile points. A more wide ranging and quick to read book than I expected. Loved the premise that we ought to have health care that respects our individuality rather than completely out come based, system based, economic based, system based care. Also glad it devoted time to routine choices, statins, BP management not only the dramatic cancer, end of life choices. Will not hesitate to recommend. Groopman is a thoughtful, respectful, empowering doctor -- too much out of my real experience with the medical profession, unfortunately. This book gave practical credence to the pleas that patients should not only be engaged in their own care but should always hold the deciding "vote" on the best care choices. I wish there were a way to flag this kind of respectful care premise when reviewing health professionals in real life. My summary: Everyone wants the longest life with highest quality. The only way to do this to become "health literary", so we could make best and hardest decisions to fit our personal need and preference among all available options, with less regret. 3) Mortality Probability Models (MPM II),Acute Physiology and Chronic Health Evaluation (APACHE) II, The disability-adjusted life year (DALY) . 1. mindset peoples toward medical treatment: believers/doubters; maximalists/minimalists; technology orientation/naturalism orientation, total 6 types. believers: there is a successful solution for problem,usually technology orientation. doubters: deeply risk-averse, acutely aware of the potential side effects. Being a doubter is uncomfortable, result in intense decisional conflict. maximalists: more is better, tends to ahead of curve. minimalists: less is more, avoid treatment if at all possible. principle of beneficence: Often doctor's view of treatment best for patients may be against patients' will. principle of non-maleficent:treatment can cause a great damage for patients' body. 3. History: Family history, past medical history, social history. Availability bias: story of acquiescence with similar conditions affect more when making decision. Naturalism bias: nature will take care of). Loss aversion: emphasize on loss, not pay attention to gain. Projection bias: p 101 the physician's advice was framed to minimize the side effects of the treatment he's recommended and accentuate the side effects of other possible treatments. Focusing illusion: focus lives that would be negatively affected. Framing of number: 35% cured vs. 65% not cured. p57 Preference: the utility or value that a person assigns to a particular outcome. Patients with "blank state" who has no preference of treatment is susceptible to the doctors' own preference for treatment. 4. p 62 net benefit: the potential gains from the treatment minus the downsides. 5. p63 - 67 best practice or guidelines or default options: how committees of specialists make guidelines. p64 (guidelines) if not rewritten, should be automatically suspended after 5 years. p66 The pressure to follow standard medical care and guidelines which may not fit to the individual need. 6. p74 misery index: originated from economics, in medicine means how much pain and limitation a person is experience from a condition, different people have different thresholds of pain. 7. p 75 "hot" and "cold" emotional states. 8. p79 "normal" vs. "nonstandard" decision, patients tends to become a frighted child in front of authority figure, unable to think logically. 9. p85 shared medical decision making , doctors should encourage the patient, prompts him to explore his feeling and preferences. 10. p96 3 methods to assign utility number: rating scale; time trade-off; standard gamble. This book addresses the issue of how we make decisions about our medical care. Most of the book is comprised of case studies, actual patients who had to make decisions like whether to take cholesterol-lowering drugs, have knee surgery or sign do-not-resuscitate orders. Drs. Groopman and Hartzband let the patients talk at length. Their stories are not simple tales with black-and-white answers or outcomes. The patients dither, they procrastinate, they clam up when they should talk frankly, they cha This book addresses the issue of how we make decisions about our medical care. Most of the book is comprised of case studies, actual patients who had to make decisions like whether to take cholesterol-lowering drugs, have knee surgery or sign do-not-resuscitate orders. Drs. Groopman and Hartzband let the patients talk at length. Their stories are not simple tales with black-and-white answers or outcomes. The patients dither, they procrastinate, they clam up when they should talk frankly, they change their minds, they reject medical advice. Sometimes they do the right thing, sometimes they don't. I appreciated this ambiguity. We often read medical horror stories and think, "Well, I wouldn't have made a mess of it like they did. I would have done the right thing." These stories show that the right course of action is often not clear or straightforward, and even when it is, it may be a difficult action to take, for many reasons. Drs. Groopman and Hartzband do a fine job of identifying ways patients typically respond to medical advice, especially in the concluding chapter. You can skip right to that one, if you want: some people are believers, some doubters, some trust in natural therapies, some in technology, some people are minimalists, others maximalists. Most of us harbor some mix of these tendencies that guides our medical decision making. I'm not sure the book addresses "how to decide what is right for you" as the subtitle suggests. I found the book to be more descriptive than prescriptive. And, I suspect that when most of us become patients we won't have the same luxury to weigh options and come to reasoned conclusions as the people in this book did. After a while, I just wanted to shout at some of these folks, "Take the pill! Have the surgery!" In Your Medical Mind, Drs. Groopman and Hartzband have created something of a sequel to Dr. Groopman's earlier How Doctors Think. This book, however, focuses on the patient's part in the medical decision-making process. The authors provide some very practical suggestions for patients (which at some point will include just about everyone) in dealing with the sometimes overwhelming volume of information presented regarding diagnoses and various treatments, and what to do when the experts don't agr In Your Medical Mind, Drs. Groopman and Hartzband have created something of a sequel to Dr. Groopman's earlier How Doctors Think. This book, however, focuses on the patient's part in the medical decision-making process. The authors provide some very practical suggestions for patients (which at some point will include just about everyone) in dealing with the sometimes overwhelming volume of information presented regarding diagnoses and various treatments, and what to do when the experts don't agree. They also present a way to identify what type of medical decision-maker you are. Generally, everyone falls somewhere between a naturalist bias and a bias toward technology, between being a maximalist and being a minimalist, and between being a believe and a skeptic or doubter. Knowing your individual tendencies, it's easier to be aware of any pitfalls of those frames of mind and to, therefore, make better decisions. They point out frequently that even experts often disagree on the "best practice" and which treatment they recommend. Even the guidelines upon which the government and many insurance companies base their payment structures can and do change often. They decry the "creeping paternalism" that would insist on standardizing care base on those oh-so-changeable guidelines, limiting the options of physicians and patients alike to find the individual choice that is best for them. "Navigating a medical decision is a dynamic process" that requires good, clear, and repeated communication to ensure that the decisions being made fit with the patient's desires. As Drs. Groopman and Hartzband reiterate many times, "the ultimate choice is always the patient's," and the information in this book will help patients feel more empowered and capable of making those choices. If you were suddenly diagnosed with a life threatening disease, hospitalized with sudden collapse, or your loved one were in those situation, how you would manage the choices for the medical treatment in front of you. The reason I picked up this book was my recent experience in the experience I was in. I was not prepared with the situation and I was not sure how we can decide the choices provided in front of us and our choices were right or not and other choices would had been the better one. I would like to know how other people act when they are in this situation. would be in a maze of choices. Then you might be search for the answer in the internet. This book explains how different personality bents factor into make medical decisions. Maximalists want everything possible done for them. Every test; every treatment. Minimalists hestitate taking an aspirin for a headache. Maybe a brisk walk or a nap will accomplish the same thing. Then there are folks who place high value on autonomy. They want to make all the decisions themselves, while others are quite happy to delegate it to the experts (i.e. doctors). The authors do not say one style is rig This book explains how different personality bents factor into make medical decisions. Maximalists want everything possible done for them. Every test; every treatment. Minimalists hestitate taking an aspirin for a headache. Maybe a brisk walk or a nap will accomplish the same thing. Then there are folks who place high value on autonomy. They want to make all the decisions themselves, while others are quite happy to delegate it to the experts (i.e. doctors). The authors do not say one style is right and the other wrong, rather they use case studies to demonstrate how each preference plays out in a medical setting. We see a maximalist and minimalist wrestle with whether to take statins. We see two men trying to decide which is the best treatment for their prostate cancer. The authors present some interesting facts when it comes to end of life care. Despite having "living wills" in place, roughly half of the patients change their mind when they are face to face with their mortality. In addition, research shows that surrogate decision makers (i.e. health care POAs) do not predict the patient's wishes accurately one-third of the time. A very good reference for those facing medical issues. I appreciated the tone of the book as well as the discussion on psychology of why we think the way we do about these issues. How should we best approach a decision that may have an impact on our lives? Do we wait, and if we don't how do we choose what is best for us and not best for our doctor or for others? The book lays out some of how our minds work and change over time - something we may take heavily into consideration now, our future se A very good reference for those facing medical issues. I appreciated the tone of the book as well as the discussion on psychology of why we think the way we do about these issues. How should we best approach a decision that may have an impact on our lives? Do we wait, and if we don't how do we choose what is best for us and not best for our doctor or for others? I listened to the audiobook version of this book while commuting to and from work. That makes it difficult to pay attention to all the details. Having said that, this book helped me to think about my own approach to solving medical problems, and about why I sometimes follow doctor's orders and sometimes get another opinion, or search for more natural alternatives. I can see how my "medical mind" has changed a bit over the years, and this book has helped me to see why. It also has helped me to think I listened to the audiobook version of this book while commuting to and from work. That makes it difficult to pay attention to all the details. It also has helped me to think about end-of-life decisions, and what I decide now might actually change later in life.